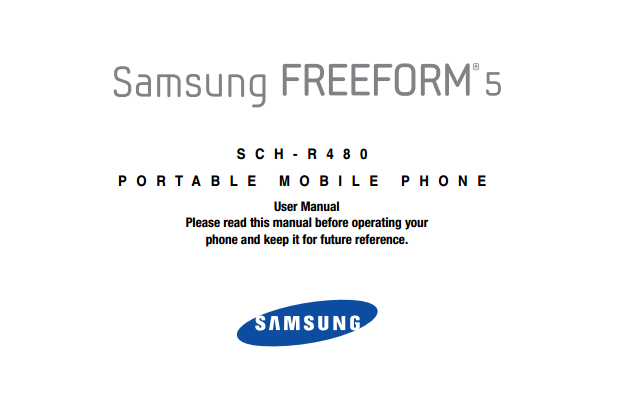 The Samsung Freeform 5 Manual or user guide is important because provide many instructions or tutorial especially how about using this smartphone with correctly. In additian also provide reference informaiton about troubleshooting. The Samsung Freeform 5 is avialable in U.S. Cellular carrier. It comes with CMDA network with frequency of 850MHz and PCS network with frequency of 1900MHz. It has 2.4", QVGA TFT display screen. It's also equipped with 3.0 MP camera, 4x digital optical zoom. Other specs and features you can read in the manual on page 12. The Samsung Freeform 5 user manual (SCH-R480BKAUSC) is available in english language. It's consisting of 137 pages. It's also devided into 11 section. This manual provide detail reference information such as phone layout with key functions, how to activating phone, using memory card, using menu navigation, using contacts and messages, make phone calls, using camera and camcoder, using internet, using bluetooth, phone settings guide like display and sound settings, call settings and more. For troubleshooting guide you can read here.